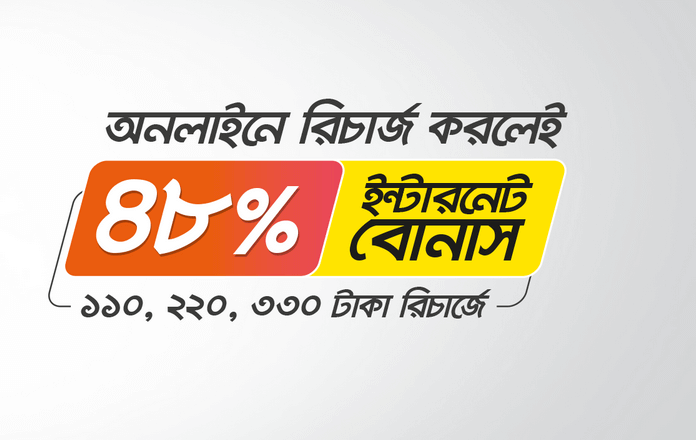 Banglalink Online Recharge Offer (48% Offer)! Online Recharge Internet Bonus! Banglalink is offering online and ATM recharges 48% internet bonus on the occasion of 48 years of independence. That means online or ATM booth Tk 110, 55 MB in recharge, 110 MB at recharge and 160 MB internet bonus at recharge 330. 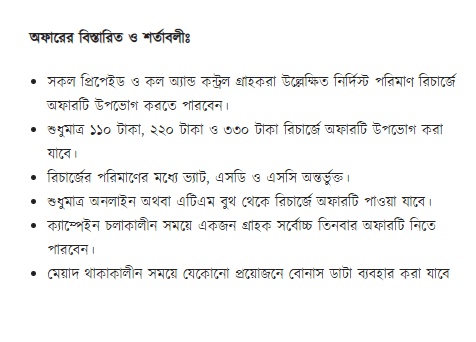 Enjoy the independence of Banglalink internet bonus. Banglalink ATM recharge offer here, New BL recharge offer 2019, enjoy free Banglalink MB offer. 55 MB bonus on Tk. 110 recharge, 110 MB bonus on Tk. 220 recharge & 160 MB bonus on Tk. 330 recharge from online and ATM both. All prepaid and call and control customers will be able to enjoy the offer in the given amount of recharge. Offer can be availed at only Tk 110, Tk 220 and recharge of 330 Tk. Bonus data can be used for any requirement during the validity period. During the campaign, a customer can take the offer for a maximum of three times. The recharge offer can be available online or ATM booth only.